← Can you handle The Green Monster? This is it. This is the big one. I created a list (over 250 pages long) of every single song I have in my 80s playlist on my iPod (the PDF is at the bottom of this blog post). It is comprised of music in every genre of the decade. It’s the music everyone was listening to: radio hits, MTV hits. It’s what I was listening to: soundtrack songs, album tracks. It’s the music I would have been listening to had I known it existed back then. It’s by no means a complete playlist of everything that was out, so no angry comments if your favorites aren’t on it. After all, this is the playlist I have to listen to, so while it’s pretty exhaustive, it still caters to my tastes. With few exceptions, these songs all come from my vast collection of vinyl and CDs. In rare cases, I’ve had to grab an MP3 of a song that is simply impossible to track down on physical media. Also, the time span is not precisely January 1st, 1980 to December 31st, 1989. This is music that defines the sounds of the 80s, from early punk and new wave that ended the 70s, to synth pop and hair metal that spilled over into the early 90s before techno and grunge took over. Therefore, disco songs from the early 80s as well as late 80s club music that introduced the house sounds of the 90s have not been included. 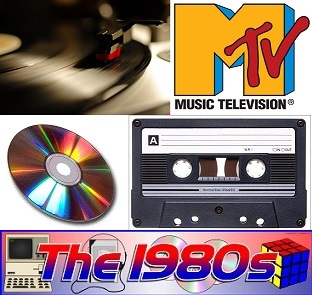 The songs in this playlist are meant to bring to mind the sounds of the 80s. In terms of sequencing, I begin with the “hits,” chronologically by when they were most popular or hitting the pop charts. However, this section begins in the 70s with those punk and new wave songs that would heavily influence alternative sounds of the 80s, before segueing into pop chart hits, and runs straight through the beginning of the 90s when 80s sounds were still spotting the charts. After that come the non-“hits.” These are grouped into categories like arena rock, power pop, new wave, synth pop, club, pop, and mellow wave. This is by no means my way of confining particular songs to a label or defining genres, but simply a way to bring together similar sounds that capture an attitude or mood. So the “girl wave” section isn’t meant to be just “new wave” songs by females artists. For me, it designates the wave of female-fronted songs that define the 80s sounds, so you might find Sheena Easton or the Pointer Sisters right next to Nina Hagen or Siouxsie. Another example. Of course you’ll find Alice Cooper in the arena rock category, but he also makes the new wave section because he recorded tracks that capture that sound perfectly. Don’t bother arguing with me about these groupings, because it’s my playlist, and I’ll program it the way I want to, dammit! This list is as it appears in my iPod, and the sections have headers in case you want to do a keyword search. That’s it. So here goes. The complete list for your reading pleasure. Whenever I make changes to the playlist (which usually means adding more songs), I’ll update the upload. And please don’t contact me asking me to send you certain MP3s or burn you CDs. I’m not a free music service! This entry was posted in Living in the 80s - forever, Sound Check - The Songs Stuck in My Head and tagged 1980s, 80s, new wave. Bookmark the permalink.